To help prevent viewers from ever experiencing a kidney stone, following are myths and truths to help keep your kidneys healthy and happy. 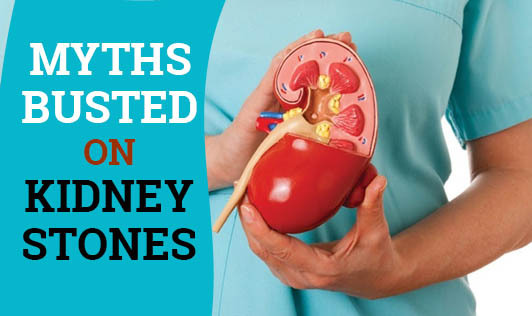 Myth: If a person has kidney stones, he or she is more likely to have gallstones. Fact: Gallstones and kidney stones are not related at all. They form in different areas of the body. Typically, those at risk for developing gallstones are a different group from those who have kidney stones. Maintaining a healthy diet with normal amounts of calcium, drinking adequate amounts of fluids, and seeing your doctor for regular check-ups are a good prescription for all of us. Myth: Once a person has kidney stones, there's nothing that can be done to prevent future stones. Fact: It's true that once you have a kidney stone, you are more likely to have others down the road, but there are some things that you can do to help prevent this from happening. As with other chronic conditions, the best treatment for kidney stones is prevention. Drinking plenty of water throughout the day is one of the best ways to prevent future stones from forming. Your doctor may also want to run some laboratory tests and take a medical history to determine the factors that need to be changed to reduce the risk of future stones. A special diet and/or medicines may also be prescribed for you. The most important thing you can do is to ask your Health Expert what you can do to prevent kidney stones from recurring. Myth: Less than half of kidney stones are passed spontaneously. Fact: Up to 85% of kidney stones are passed spontaneously. Intervention being needed depends on the stone's position and related factors. In the absence of infection and obstruction, and with adequate pain control, a stone may be left to pass on its own. Myth: After a kidney transplant, the patient is absolutely fine and doesn't need medication or precautionary measures. Fact: Kidney transplant doesn't mean a patient is free to eat anything and live the way he wants. The patient needs to take prescription medicines and is also required to do routine check-ups, ignoring which, can reactivate the problems faced earlier. Healthy kidneys process about 200 quarts of blood to sift out about one to two quarts of urine a day.